Please visit http://muldersoft.com/ for news and updates! 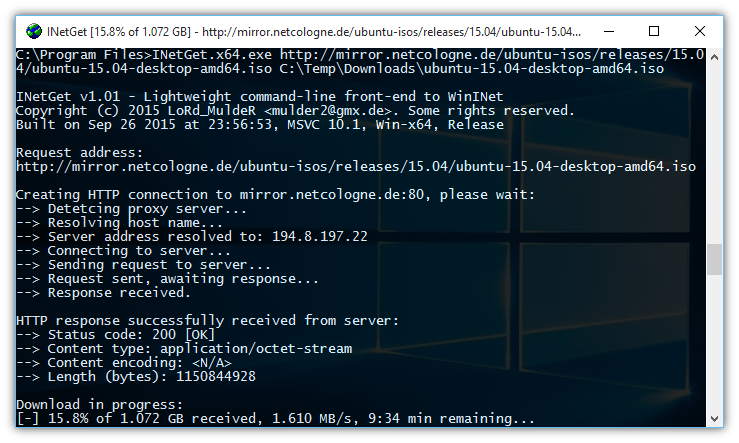 INetGet is a simple command-line interface to the WinINet API. In other words, it is a program for downloading files via the HTTP (Hypertext Transfer Protocol) or FTP (File Transfer Protocol) protocols. It provides full support for HTTPS (HTTP over TLS) as well as IPv6. This program provides a similar functionality as the well-known WGet and cURL tools. However, in contrast to those, INetGet is based directly on the "native" Windows Internet programming interface (WinINet). This comes at the advantage that INetGet is very small and lightweight, as it uses the HTTP(S) and FTP services provided by the operating system, instead of having to implement these protocols on its own. There are no external dependencies (e.g. OpenSSL or GnuTLS), except for standard system libraries that are present on every Windows system anyway. Still, advanced features, such as HTTPS and IPv6, are supported. Furthermore, since INetGet is based on the Windows crypto libraries, it uses the Windows certificate store. This means that, in contrast the aforementioned tools, you do not need to provide and maintain your own certificate bundle for HTTPS. Certificate updates as well as security fixes for the underlying cryptographic routines are automatically provided, via Windows Update. On the downside, you will have to trust Microsoft's protocol implementations. And the availability of some features depends on the Windows version. INetGet works on Windows Vista or any later Windows version. Windows XP should work too, but is not recommended these days! The 32-Bit version of INetGet runs on all 32-Bit and 64-Bit Windows versions, while the 64-Bit version of INetGet requires a 64-Bit Windows version. IPv6 support requires Internet Explorer 7 or later. Note that all supported Windows versions (Vista or later) already meet this requirement. Windows XP requires manual update to IE7 in order to enable IPv6 support. As far as HTTPS support is concerned, all relevant Windows versions (XP or later) support TLS 1.0 as well as the deprecated SSL 2.0 and SSL 3.0 protocols. Support for TLS 1.1 has finally been introduced in Windows 7. And support for TLS 1.2 has been introduced in Windows 8. Specifies the target Internet address (URL) to be downloaded, given in the <scheme>://[<username>[:<password>]@]<hostname>[:<port>]/[<path>][?<query>] format. The scheme (protocol) and the hostname components of the URL must always be specified! The path component as well as the port number and the query string are optional. Also, the username and the password components are optional too, but you can not set a password without username. Last but not least, do not forget the trailing / if the given the path is empty! Only the http, https and ftp protocols are currently supported. The hostname can be specified either as a domain name or as an IP address. The standard IPv4 and IPv6 notations are supported. If the port number is absent, a default port number will be assumed. This results in port #21 for FTP, port #80 for HTTP and port #443 for HTTPS. The special URL string - may be specified in order to read the target address from the stdin stream. When reading the URL from stdin, INetGet assumes that the string is passed in UTF-8 encoding. Specifies the output file, where the downloaded file will be written to. If the given path specification is not fully-qualified, then the relative path will be resolved starting from the "current" directory. The given path must point to an existing and writable directory, otherwise the download fails. If the specified file already exists, the program will try to overwrite the existing file! The special file name - may be specified in order to write all received data to the stdout stream. Furthermore, the special file name NUL may be specified in order to discard all data that is received. Specifies the HTTP method (alias “verb”) to be used in the HTTP request. This can be one of the standard methods GET, POST, PUT, DELETE or HEAD. By default, the GET method is used. Append additional data to the HTTP request. The given data is expected to be in the application/x-www-form-urlencoded format, i.e. the standard format that used by HTML forms. You can specify - as the argument in order to read the data from the stdin stream. Note that you probably want to specify either --verb=POST or --verb=PUT too when using this option. Instructs the WinINet API to resolve the host name locally, i.e. not use a proxy server. If this option is absent, the system's default proxy server settings will be used to resolve the host name. Overwrite the default user agent string that will be sent by INetGet in the HTTP request. This string typically starts with the Mozilla/5.0 prefix, followed by system and program information. Do not follow HTTP redirects. If this option is absent, INetGet automatically follows the address given in the response's Location field, when a HTTP redirect (e.g. status 302) is received. Do not cause HTTPS requests to fail, if the server's TLS/SSL certificate is invalid (e.g. already expired or wrong DN) or cannot be validated (e.g. unknown issuer). Use this with extreme care !!! Includes the given referrer address in the HTTP request. If this option is absent, INetGet does not generate a Referer field in the request. Triggers a standard system "notification" sound as soon as the process has completed. The type of the sound depends on whether the download has completed successfully or failed. Specifies the connection timeout, in seconds. You can specify fractional values. Specify infinite to disable the timeout. If this option is absent, the system defaults will be used. Specifies the receive (and send) timeout, in seconds. You can specify fractional values. Specify infinite to disable the timeout. If this option is absent, the system defaults will be used. This option is a shorthand for setting both, --time-cn=<n> and --time-rc=<n>, at the same time. You can specify fractional values. Specify infinite to disable the timeouts. Specifies the maximum number of times that INetGet will retry to connect to the server, if the connection could not be established yet. By the default, INetGet will retry at most two times. Do not retry to connect to the server, if the connection could not be established the first time. Setting this option is equivalent to specifying --retry=0. If specified, causes the connection to fail in case that the certificate revocation list (CRL) could not be retrieved. This is more secure, but also means that HTTPS connections may fail more often. By default, INetGet does check for certificate revocations. However, if the CRL can not be retrieved for some reason (and thus the revocation check is impossible), it will skip the check. If specified, INetGet will change the "Creation" and the "LastWrite" time-stamp of the output file to the value that was returned in the Last-Modified field of the HTTP response header. This option is typically (though not necessarily) used in conjunction with the --update option. If the server did not include a Last-Modified field, this option does nothing. If specified, update mode is enabled. In this mode, INetGet will only re-download the file and replace the output file, iff the server provides a newer version. Otherwise, the existing file is kept. Update mode is implemented by reading the "LastWrite" time-stamp of the existing output file. If successful, a corresponding If-Modified-Since field is added to the HTTP request. The server should reject the request with status 304 (Not Modified), if no newer version is available. If the specified output file does not exist, INetGet will downloaded the file unconditionally. If specified, INetGet will retain an incomplete output file, if the download has failed or it has been aborted. Otherwise, INetGet tries to delete the incomplete file, if something went wrong. Loads additional INetGet options from the specified configuration file. Several configuration files can be specified, in which case the "pipe" (|) symbol must be used as a file name separator. If this option is present, INetGet will print the "help screen" to the console and then exit immediately. Enables verbose logging, i.e. writes additional status information to the console. This is intended for debugging purposes and does not normally need to be specified. If the download completed successfully, INetGet returns a zero (0) exit code. Otherwise, if something went wrong (connection to server failed, file not found, etc), it return a non-zero (1) error code. Note that only HTTP status codes in the 2xx range will be considered a successful transfer. If the server returns a different status code, e.g. in the 4xx or 5xx range, the transfer has failed. INetGet supports reading options from a configuration file. Configuration files can be loaded explicitly by using the --config=<cf> option on the command-line. In addition, INetGet will implicitly load a configuration file that is located in the same directory as the INetGet executable file and that has the same basename as the NetGet executable, but with a .cfg file extension. So, e.g., if the INetGet executable file is called INetGet.exe, then the configuration file called INetGet.cfg (and located in the same directory) will be loaded implicitly, if existing. Configuration files support the same options that can be specified on the command-line. Furthermore, the option syntax for configuration files is the same as on the command-line, except that configuration files do not require or support the -- option prefix. This means that, e.g., instead of --agent=Foo, the configuration file has to contain agent=Foo. Finally, INetGet expects that there is exactly one option per line in the configuration file. Any lines starting with a "hash" (#) symbol are considered to be comments and will be ignored. Blank lines are ignored too. Note: If a configuration file is loaded implicitly, this occurs before processing the options given on the command-line. Consequently, you can use the implicitly-loaded configuration file to set up some default options, which then may be overwritten on the command-line. Occasionally, it may happen that your so-called "anti-virus" software mistakenly detects malware (virus, trojan horse, worm, etc.) while you are trying to run the legitimate INetGet application. This is called a false positive and the file actually is not malware! Instead, this is a defect (bug) in your particular anti-virus software! In case that you encounter this kind problem, we highly recommend using VirusTotal.com, Virscan.org or a similar web-service to check the file in question with multiple anti-virus engines. Unless the majority of the anti-virus engines detect malware, it can safely be assumed that the file is indeed clean. Also, please take care with heuristic scan results, such as "suspicious", "generic" or "packed". Those results are not confirmed malware detections – they are highly speculative and (almost certainly) do not indicate a real infection. An important fact to consider is that, for the developer of a legitimate application, it is impossible to know why a specific "anti-virus" software is defaming her application as malware. That is because anti-virus programs generally are commercial ClosedSource software – and the anti-virus companies do not publish their source codes or reveal their algorithms. Moreover, a zillion of different so-called "anti-virus" programs exist nowadays. Therefore, the application developer can not know what is going on "behind the scenes" in a particular anti-virus software. Consequently, any assumptions on the reasons that trigger the false positive would be nothing but pure speculation! Even worse, anti-virus software is updated frequently, so the reasons why the so-called "anti-virus" software is defaming our application as malware may change constantly. At this point, it should be clear that implementing workarounds for defective anti-virus software is not a viable option for application developers. Since the false positive is a defect (bug) in the particular "anti-virus" software, it can be fixed only by the developer of the anti-virus software. For this reason, it is important that you, the (paying) customer, contact the support team of the anti-virus company and report the serious problem that exists in their software! Most anti-virus companies provide ways to report false positives in a standardized way, e.g. by means of a webform or an e-mail portal. So please refer to the anti-virus developer's web-site for help and support. Also, when reporting false positives, please be self-confident: As a paying customer, you can demand that false positives get fixed in a timely manner. Otherwise, just get your money back! This software is released under the GNU General Public License (“GPL”), version 2. All blocking I/O operations have been moved to separate "worker" threads in order to make the application more responsive. Added "update" mode, i.e. re-download the existing file only if the server provides a newer version. Enable with --update option. Added --set-ftime option to set the local file's "LastWrite" time-stamp to the "Last-Modified" time provided by the server. Incomplete or failed downloads are now removed by default. You can use the --keep-failed option to retain incomplete files. Correctly show file size and remaining time for files larger than 4 GB, provided that the server sent a Content-Length field. The path and the query components of the URL as well as the POST data string are now converted to UTF-8 and then percent-encoded. Update console window title in order to show the current INetGet progress. Restores original title on exit. Added support for setting INetGet options via configuration files. Use --config=<cf> option to load a configuration file. This is the first public release of the INetGet application. FTP support is not yet implemented in this version.